Its Balloon Fiesta, a time of year beloved by humans and hated by dogs. (Well, hated by some humans too. It can cause some pretty gnarly traffic jams). My dogs were just skulking around the kitchen whimpering, so I knew one must be overhead. 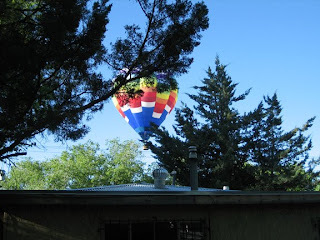 Living in the southern part of the city, the balloons are often looking for a field to land in by the time the make it this far, and are therefore floating just above the treetops. They travel so quietly that you can often hear the voices of the passengers in the gondolas. Terrifying for dogs, for whom balloons seem like stealthy giant birds that hiss at them from above. (The gas jets turn on and off at regular intervals that really do sound like breathing). For us humans however, they are lovely. Rather like fireworks-- you don't remember how lovely they are until you see them rise en masse and float through the skies. The one that just passed wasn't particularly low in the sky, and I didn't think to snap a photo, but here is one from last year. Just above my mom's roofline.